A quick post to shamelessly push my recruitment drive for playtest groups for The Adventurer's Tale. I've spoken about it in previous posts and it's now at the point where I'm eager to get it tested out by as many GMs as possible. Full details are available on two of the forums you're probably familiar with and feedback can be sent by way through either of them. Give it a try with some friends and let me know! As I've been tweaking monsters for The Adventurer's Tale I've decided to post the key points I've been keeping in mind for each monster, each of which consists of one paragraph of text followed by the data. Why would the adventurers be fighting this? How does this monster behave when the adventurers encounter it? What are its relationships with some other monsters? How can the GM easily adjust this monster to make it more or less powerful, or simply different? Does this monster really need its own entry? Sprites: One monster entry for pixies, brownies, (real) gnomes and even gremlins. Simply make pixies more agile and give them wings, give gnomes a higher Craft stat and give Gremlins the goblin dodge ability that makes them extra slippery and mischievous. Beastmen: This entry covers your warhammer style goatmen, hyena-like gnolls and even stretches to ratmen and lizardman. The last two being more sneaky (higher Grace and maybe some Rogue perks) and tougher (scales counting as light or heavy armour) respectively. Chimera: You've got your lion/goat/dragon chimera here as well as Griffons, Hippogriffs and Manticores. Minor differences between them are noted but really one entry covers large, ferocious, winged beasts like these. Tone down its Melee stat and Damage and you could pull off a Pegasus if you need one. Giants: Here you have a base for your standard hill giant that can easily be altered into an ettin or cyclops. In addition, Ogres are really little more than small cave giants, so they're part of this monster too. Simply knock some Body off your Giant to trim him down to Ogre size. Ooze Blob: This covers all sorts of ooze. Really, coming up with your own twist on them is so easy! Yet somehow I still have three different types of dragon... hypocrisy at its finest. This encounter could fit into most fantasy systems but is presented here for the recently renamed The Adventurer's Tale (formerly Underworld and Overworld). The words Goblin and Hero might not be seen next to eachother too often, but even these wicked creatures have folk heroes that would even inspire humans. Flash has spent his life travelling from one goblin settlement to another, establishing his legacy by slaying threats to goblinkind. He shot the cave-drake at Biterzpeak, drove off the ghouls of Foulnut Forest and protected the goblins of Scummer's Bay from a rampaging sea giant. All with his crossbow and winning smile. Indeed, there has rarely been a goblin as charismatic as Flash. Even orcs have been known to be impressed by his presence. Dodge: A goblin that rolls a 5 or 6 on a combat roll will never be hit. Critical Hit bypasses. Precision: Adds an extra two points of Damage on Critical Hits when using a weapon with Damage 3 or less. Crossbow (Damage 3), Two Daggers (Damage 2), Light Armour. Flash is rarely seen without his squire and travelling partner, Bontukz. Lacking any of the charisma of Flash he mostly spends his life carrying Flash's crossbow, pointing out targets and patching up his wounds. After a few drinks he might mutter about how his spells are the real power behind Flash. Upon spotting their target, Bontukz will hand Flash his crossbow and try to hold the enemy in place with Hold. While Flash lines up his shot, usually aiming for a Vital Strike, Bontukz will use Guidance to help him achieve a killing shot. Flash's reaction to adventurers will depend upon their reputation. If he doesn't know of them he'll greet them cautiously, from a distance. However, if they are known goblin killers he'll see them as potential kills to add to his heroic legacy. 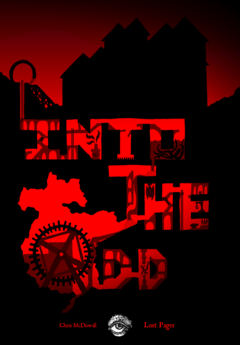 I'm getting very excited about the sandbox game I'm starting next week using Underworld and Overworld. There are some great resources out there for running a sandbox game. I've summarised the three most important considerations for this game below. In preparing for the game I've planned out a chunk of a world where the dwarfs can roam. There are some hooks here and there but no "main plot" planned out. Most hooks come in the form of places to explore and looming threats rather than an innkeeper asking you to find his hat some goblins stole. I like the tip I heard somewhere, "plot hooks not plot hammers". A hook can be ignored or saved for later, a hammer is going to be much more focused on pushing you in a particular direction. I'm hoping the map I've provided is already suggesting a hook or two before we've even started. Sure to be a contentious point. I've poured my heart into creating the world and have tried to design it in a way that will give the players a great experience, but once they step into it I'm not going to have complete control of it. It's all laid out, populated with threats and scattered with hooks and treasures. Many of these will appear when the dice decide, rather than I. If the players wander into the Underworld and are finding it too hard or too easy I have no intention of tweaking it on the fly. I also know there are some random encounters noted down that will be dangerous stuff. By no means will I try and kill the characters but I won't tone them down the hazards when things get tough. I'm hoping I've planned such places in a way that they'll be sufficiently aware of the threat, though. One thing that always bugged me about Oblivion was that monsters would scale their power level to however powerful the player character was at that point. I'm standing on the other extreme of the scale with this game. I always love a game with a great map. I want to see interesting looking locations and see some intriguing places named. I remember when I first played Link to the Past I opened up the map and decided I wanted to go and explore the Swamp Ruins. They weren't relevant to the main plot until later in the game but I still headed there and took a look around because what's not to like? Swamps are cool and Ruins are cool. I'm hoping the map for the starting area of my campaign will do the same. A larger version can be enjoyed here. Good old Hexmapper. A quick edit here. It seems reports of co-creator of D&D, Dave Arneson, dying weren't true. However, it sounds like he's still in a weak condition, so I'm going to leave the links to blogs posting their tributes here, as it's still a great time to learn about the man. Certainly no need to halt the further spreading of his legacy. Now onto the game I'm currently preparing for. An all-dwarf sandbox using Underworld and Overworld. Today I want to talk about the decision to make it all-dwarf. I think the non-human races in fantasy often get a hard deal. It's no secret they tend to be little more than single-culture archetypes and anything differing from that often gets its own race. Look at the short folk of D&D and most generic fantasy. Gnomes, Dwarves and Hobbits/Halflings. You've got your magically-inclined excentric gadgeteer race, the gruff, underground miner-warrior race and the peaceful pipe-smoking but brave race with the odd burglar. I'm mashing them all into dwarfs for this game and I think the race will be better because of it. All of the traits mentioned can fit onto a dwarf with no problem at all. Now instead of a race where everyone's an ale-drinking axeman you have a race where a settlement is likely to include all sort of characters. Not to mention a race where different settlements might play more to certain racial tropes than others. Of course, we still have the usual good-evil seperation that plagues non-humans in fantasy. I don't want dark-dwarves, deep-dwarves, derro or whatever you want to call them. Of course there might be settlements that have a reputation for being greedy but it's not part of their DNA. Perhaps it's just a stereotype or perhaps something about that settlement attracts the greedy type. On the flipside even your peaceful pipe-smoking dwarf hamlet might have one or two dwarfs that... well, are just dicks. This is a theme I want to carry through to the rest of the races in this game. Orcs, Hobgoblins, Uruk-Hai, Half-Orcs... bleh. An orc that lives underground, an orc that's part of a well trained army and an orc that's trying to fit into civilised society can all be part of the same race. And now they shall be. Anyone that wants to see more of this upcoming game can find more here. You could even join in if you grab the last slot quick enough. Next time I'll touch on why I've gone for dwarfs in particular.